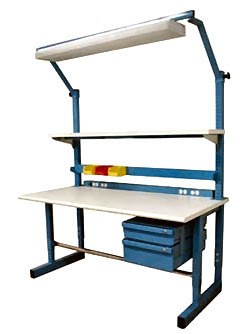 Are you looking for used technical workbenches? Crown Office Furniture in Tulsa, OK has over 200 work benches in stock and ready for immediate sale. These benches are in like new condition and are from leading manufactures such as IAC Industries , Global Industrial , Production Basics and Bench-Craft all are being sold at less than half of new prices.